Manuel is our distributor from Spain with lots of energy and ideas. He has made Point-7 big in Spain by going step by step. Let’s find out more about Manuel, and the way he is pushing windsurfing in his country, and not only the Point-7 brand. Ciao Manuel, how did you get to know Point-7? The first time I knew about Point-7 was through a windsurfing forum where I saw the Sado 2008 with a totally different design than any other sail until that moment. I searched online to buy my first sail of Point-7 (AC1 6.7 2008) and I love it. How did you get interest to start using the sails for your centre, and later even become distributor? When I was finishing my studies of Physical Education I started to teach windsurfing to earn some money and I was buying some other Point-7 sails in the website official and some boards to set up a windsurfing center. When I saved some money, I contacted Point-7 to buy a larger volume as a professional and I was buying more and more. I really have my school in a spot with very good conditions and my center was growing, I was buying enough material and I was selling the used and new material with ease, so I wanted to go one step further. I think that first as a dealer I was committed to the brand helping people from all over Spain to know the brand and give some support and help and Point-7 helped me to grow while the brand also believed. Spain is very active for windsurfing. You have the European Hawaii next door, a lot of famous windsurfing spots, and of course most of the PWA world tour events are practically organised between Spain and Canaries. How is windsurfing seen in Spain? In Spain, windsurfing is very alive now. We have many known spots and very variable and good conditions, there are conditions all year round if you move. Both national and international competition is giving results with new promises of windsurfing as well as being an incentive for all windsurfers. I think there is still a lot of work in the bases where the state and the sailing federation think they could work more, but that work is being supplied by many centers and professionals that help new athletes and promoting events and competitions. Which are the spots most Spanish windsurfers go to on the mainland? The best-known spots are the Canary Islands and Tarifa where many pro riders live. The Canary Islands are very accessible, and it is cheap, good temperature and with wind conditions insured according to time and Tarifa is the legendary Spanish spot where the pioneers of windsurfing started and still retains its natural charm and good conditions. Knowing almost all the spots in Spain I cannot leave the opportunity to highlight the conditions of Almeria in the South of Spain, for me this spot is the best and next to those of the nearby areas including my city. And of course, I will try to grow the fame of the spot of my school that there is wind every day from April to October in flat water conditions in a small lake. You have built a very successful Spanish Black Team? Tell us more about it. There is a lot of talent in Spain and I have been lucky enough to have very good riders around me and form a united team trying to follow the philosophy of Point-7. We try to get together doing windsurf, do photo and video sessions, go to competitions that we can together, and I receive a continuous feedback of the Point-7 material that I transfer to the brand. The most famous disciplines in the peninsula of Spain are waves where I have the team very close and Slalom that in Cataluña is really where I found the riders I needed and who are improving results every year. There is a young part of the team that is getting titles and some participations even in PWA and the experience of the seniors who besides motivating others also win! You have different windsurfing schools. In which locations and how do you manage to follow all your business!? My school is open from April to October, although soon we will have a spot also close in winter. But one hour from my school is the school of Mar Azul in Almerimar where I collaborate and work with Point-7, I also have a collaboration in Tarifa and soon I want to set up a center there. 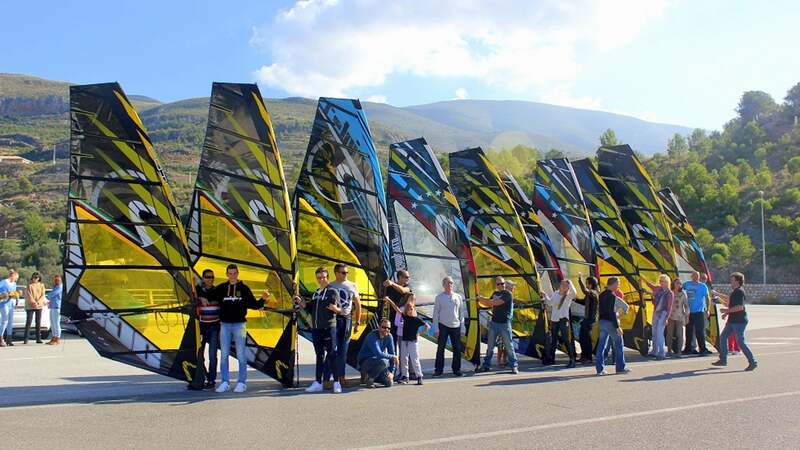 During my training as a windsurfing sports technician in Windsurf I met many people who are now promoting windsurfing. I always have loyal people and centers in which I try to be a partner and help with my resources that I get in my school to grow more. I started with a school and a windsurfing club in my city and I know the needs of these organizations. I think I will keep looking for schools and centers to work and move the Point-7 brand in Spain. What part of windsurfing do you like the most? I also do not follow the world of the bike or motor, I think I have become too fanatic with windsurfing, I am only interested in sports in natural environments and with positive transfer to windsurfing. What is Point-7 for you? For my Point-7 it is a windsurf brand that advances and always seeks to be the best. I want to continue working with Point-7 for many years and I try to promote the brand because I believe in its philosophy and in the effort, I perceive from the people who work at Point-7 and make no mistake, it’s the coolest sails on the market.